Award winners pictured from left to right: Keith Gribbins, Pete McNeil and Chris Crowell. Award winner not pictured: Sean Wright. Hey, did you know your pals at Craft Brewing Business are top 10 finalists for Website of the Year? It’s true. This is territory usually claimed by legit publishing houses, like Bloomberg, not four drunks operating via chat box. But hey, joke is on them. Today, we are attending a fancy gala at the National Press Club in Washington, D.C., to see where we placed. We had to locate suits to wear. Some of us got haircuts (the ones with hair). If we win, it will clearly be a well deserved big deal and the highest of high honors. If we finish 10th, clearly this was rigged from the jump and we didn’t even want that fancy schmancy bogus award. Either way we are flipping our table over. I suggest the brewmasters for the breweries below do the same. Here are your five beers to know this week. Four Saints Brewing Co. has partnered with Greensboro’s Urban Offsets to brew Founding Fathers Hemp Ale with a carbon-neutral process from start to finish. The beer was released at Raleigh’s Brewgaloo on April 28. The carbon emissions produced by brewing — from sourcing the ingredients to tapping the kegs — will be offset by renewable-energy and other projects in North Carolina that reduce carbon dioxide emissions. This is the first carbon-neutral brewing process of its kind in North Carolina and one of the first in the country. One of the emissions-reduction projects supported by Urban Offsets is the Cone Health Cancer Center Healing Gardens in Greensboro. As part of its work with Urban Offsets, Four Saints will fund tree plantings at the garden. All ingredients were sourced from North Carolina companies as well. Epiphany Craft Malt of Durham supplied the grain, and Bee Hoppy Farms in Pittsboro grew the hops. Founding Fathers Hemp Ale is an English mild ale that incorporates hemp flower from Asheboro-based Founder’s Hemp. The earthy, nutty beer comes in at 3.8 percent ABV and 8 IBU. Last year, the beer became North Carolina’s first legally registered hemp ale. 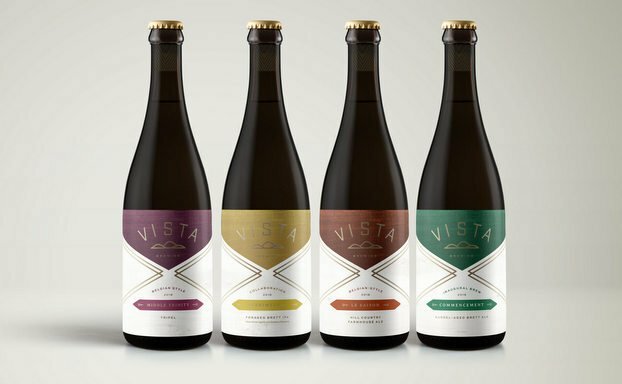 Vista Brewing, a hospitality destination located on a 21-acre historic property in Driftwood, Texas, opened on April 20 with a beer program led by award-winning Brewmaster Josh Watterson. The lineup features traditional beer styles that pay homage to European origins, while honoring the Texas Hill Country. Middle Trinity – Tripel – 8.5 percent ABV. This Belgian-style golden ale is a tribute to Vista’s pure, limestone-filtered water. Brewed with a triple dose of both malts and fine noble hops. Pours with a faint haze and a snow-white head. Inviting, mellow spiciness and clean vanilla malty notes make way for appropriate pear and green fruit with honeysuckle-like floral aromas. Merriwether – Wild IPA – 6.6 percent ABV. Floral, citrus and earthy. This spring release features super-fragrant agarita and dewberry blossoms, plus lemony wood sorrel, all added at the end of the boil. The hops and foraged aromatics in this Brettanomyces IPA create a blend of everything Vista loves about IPAs (juicy, hazy, wild). Le Saison – Farmhouse Ale – 6.6 percent ABV. Citrus, pear and peppercorn notes. Hazy straw color with a luscious white head, aromas of worn leather and citrusy peppercorns. Commencement – Brett Ale – 7.0 percent ABV. A wine-like complexity with fruity notes. This is the first recipe ever brewed at Vista and the inaugural release of our growing barrel program. This 100 percent Brettanomyces fermented beer spent over two months in freshly emptied red wine barrels from Bending Branch Winery (Comfort, Texas). This is a limited release and only 1,000 bottles are available. •Watermelon, Chiquen & Gritz at Against the Grain Brewery in Louisville, Ky. (May 2) – A golden ale with watermelon and will be packaged and sold in 16-oz can format. •The Humdinger at Monday Night Brewing in Atlanta, Ga. (May 18) – Simply put, it is a mashup of the best of Atlanta and the best of Kentucky. This Imperial Rye Stout is aged in Kentucky Bourbon Barrels and steeped Ugandan vanilla beans in the mix. The result is a 12 percent roasty, dark beer with spicy and earthy undertones, but with a classic sweetness thanks to the vanilla and Bourbon. The group is also in the initial stages of developing a reality show that will follow the band as they visit craft breweries in markets they perform. Stroh Brewery Co. is releasing a new beer called “Perseverance” that is brewed in the style of a Detroit Session IPA. It’s the first product launch for the company since reintroducing the Stroh’s Bohemian-Style Pilsner in 2016. Perseverance IPA will be sold exclusively in Michigan, and a symbolic first pour was held at 6 p.m. on May 9 at Brew Detroit. Stroh’s Perseverance IPA is a flavorful, hoppy session beer with a moderate, 4.5 percent ABV. Perseverance IPA is brewed exclusively at Brew Detroit under direct supervision of Stroh’s Master Brewer, Greg Deuhs. Detroit artist Kobie Solomon worked in collaboration with Stroh’s to design the brew’s label. “The Chimera” is an original illustration by Kobie, showcased as one of the largest graffiti wall murals in the state of Michigan at nearly 9,000 sq ft. Perseverance IPA has begun shipping to independent beverage retailers throughout Michigan. It will be available on draft and in 12-oz bottles at select pubs beginning next week. A tiny photo to intrigue you. Two Brothers Brewing Co. is getting ready to celebrate the sun actually being out in our neck of the woods with the release of three perennial favorites including Dog Days, Twenty-Plus and Pahoehoe Coconut Ale. Pahoehoe Coconut Ale. What goes better with summer than the smell of coconut? Pahoehoe offers an aroma of sweet coconut with hints of vanilla and citrus. Delightfully sweet, Pahoehoe’s generous coconut flavor shines behind a balanced malt backbone. Coconut water and toasted coconut adds a smooth, creamy texture and a dry refreshing finish perfect for the summer time. Dog Days. This golden lager is perfect for summer cook-outs as it features a delicate caramel malt character, balanced by a light body and mild German noble hops, creating a crisp, refreshing finish. Twenty-Plus Pilsner Lager. If you’re looking for something that screams summer then we have one just for you! Twenty-Plus is a hop forward pilsner lager that is clean and refreshing, with a pale straw color and dense white head. This light-bodied pilsner lager gives off herbal and floral flavors with a nice spicy black pepper character. Update: We did not win first place. We will update further with info on a GoFundMe to bail us out of where we are being held. Thanks to all who plan to donate. Y’all stay killin it with the content! Good luck!